This is a very pretty large 25"vinyl doll, in her original outfit, and is made by Goldenvale. She has been designed by professional artists. delicately handcrafted with the finest materials. For its own distinctive personality and appearance, the doll is limited to 2000pcs worldwide. We have called her Sophia.
. large blue open eyes which have raised clear pimple effect over the eyeball. This creates a very lifelike look about the eyes and reflects light onto the eyes.
. "real" upper and lower eyelashes to both eyes. .mouth is slightly open and has a look of lip gloss on the lower lip which again creates the impression of wet lips.
. lovely amount of blush to both cheeks, painted eyebrows and has a blond wispy wig glued to her head. 1/4 vinyl arms and 1/4 vinyl legs and feet. a white cloth stuffed body. She would look lovely displayed in a store as a mannequin as she is quite large and would be able to wear baby sized clothes similar to the Kader doll of the 1960's. The baby clothes that fit her are usually 00 sizing. She comes to you dressed in her original untagged outfit which consists of a sleeveless all in one leggins. The bodice has a picture of a bear and baby written on it. She also has a matching jacket with a hood to keep her warm. Her cloth body is in a sitting position. Her neck appears to be able to be moved partially but her legs and arms are not jointed. She is so pretty and looks lovely displayed. "Luke" is another Goldenvale vinyl doll. He has his certificate of authenticity hangtag, original satin sailor suit, sailor hat, blue white striped socks, white lace up shoes, little teddy bear, and his matching white satin blanket to sit on. .teddy bear is jointed at neck arms and legs. He is made of soft fur with stitched black paw claws, nose and mouth and black button type eyes. 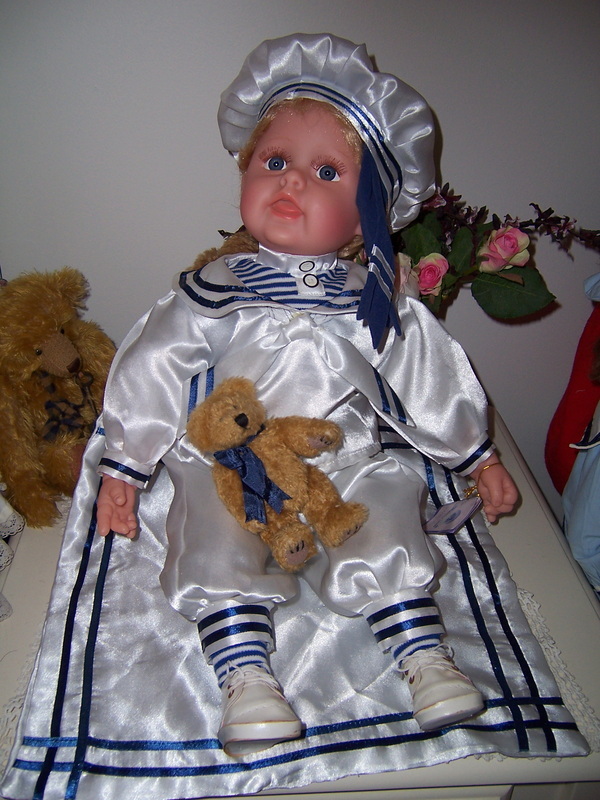 Luke is a lovely boy doll dressed in his gorgeous satin sailor suit, and comes with his Teddy Bear friend, and original hangtag. Sugar Britches was made by Beryl Brown in 1987. This doll is so darn cute and realistic, it is hard to part with her. She looks like a real baby who is sleeping and she just cuddles into your arms - a bit like a reborn doll. She comes with her original tag, and original receipt from the store where she was sold. These will come with her. She has a wax poured head and neck, wax poured clenched hands, pink cloth bean filled type of body, cloth arms, and cloth legs and feet. Her cloth legs and arms are attached with buttons and they can swivle so arms and legs can be moved to different positions. She has a brown colour baby short styled glued on wig. She has a sleeping face with her eyes closed and brown coloured eyelashes sitting on her cheeks. Her outfit is just gorgeous and going by the receipt it is now 25 years old. Her clothes are just what a real baby would be wearing. 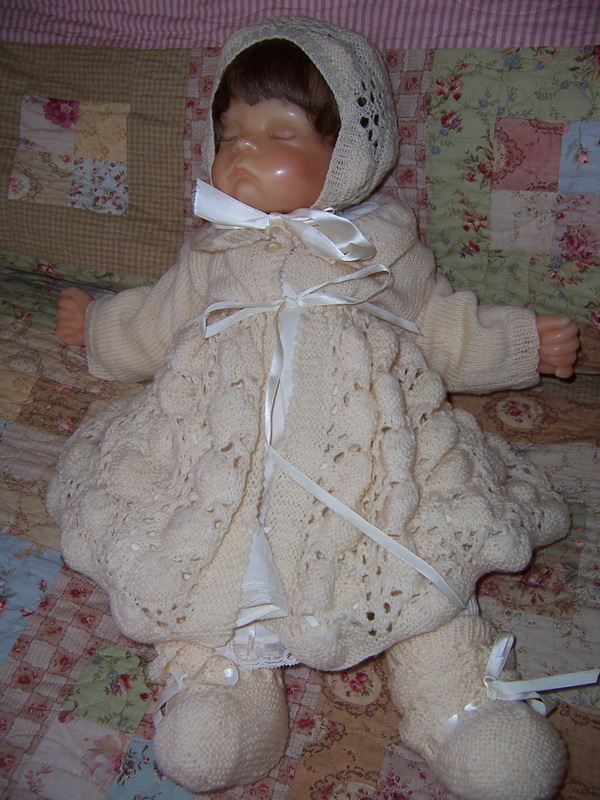 The vintage baby dress has been machine embroidered on the bodice, and has long sleeves. The dress has a ruffle around the hem and pink ribbon inserted lace above the ruffle. 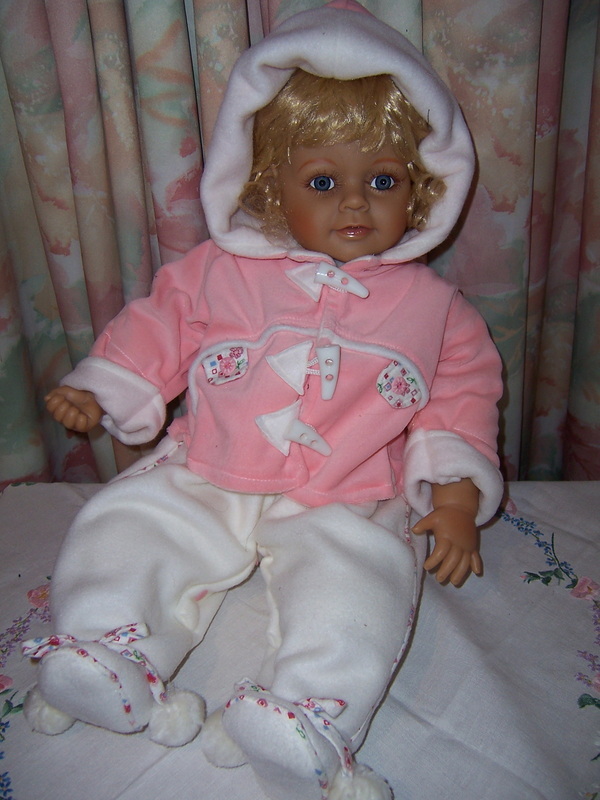 Sugar Britches has a very pretty hand knitted ensemble of a bonnet, booties and along jacket cardigan which have the shell stitch pattern on it. This knitted outfit is 25 years old now so it has a bit of wear to it, which we have mended . Our mending has been done quite well and hard to see unless pointed out to you. Unfortunately this is what happens to vintage knitted items. Sugar Britches is very realistic, and looks so sweet with her sleeping face.